BEFORE: There’s no specific reason for choosing Anger Management today. But it does star Jack Nicholson in addition to appearances by Woody Harrelson, John Turturro, and Marisa Tomei so things are looking good so far. AFTER: Anger Management is a good example of why you should give things a chance. The first thirty minutes or so were completely idiotic and as unfunny as you can possibly get for a comedy film. 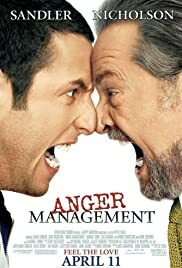 Dave Buznik (Sandler) keeps getting accused of losing his temper when in fact he is the calmest person in the room. Everyone else overreacts and pretends Dave is the insane one. My only thought was how could I sit through another hour of this nonsense. Then things got manageable when you meet other members of Dr. Buddy Rydell’s (Nicholson) anger management therapy group. As expected, John Turturro gave a wonderful performance as Dave’s anger ally, Chuck. At this point of the film you also see a lot more of Nicholson who is much better than Sandler is and an amazing Woody Harrelson who nails his role. So you put up with the horrible beginning just to be content with some great acting (and some mediocre) in the middle. But the ending, was the best part of the film. I wouldn’t say it justifies the beginning, but rather explains or clarifies some of the reasons why the beginning was so horrible. If you don’t give the film a chance then you really are missing out on a good ending. I’m not saying the end justifies the rest of the movie; it doesn’t. The director, Peter Segal, could have done a much better job and make the beginning entertaining while still setting up what happens at the end. But if you give up after the first ten minutes, you only see the bad parts instead of some, quite funny, scenes at the end.